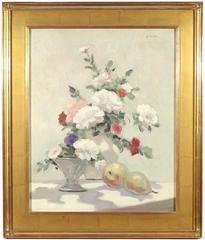 Large elegant floral still life of brilliantly colored pink peonies with stems of white lilac blossoms. Oil on paper on panel measures 28 1/2 x 23 1/2; framed dimensions are 36 3/8 x 31 1/8 x 1 3/4. Artist's signature, lower right. Housed in a soft-gold colored frame with white linen liner. Weight is 11 pounds. Jean Chaleyé was born in in 1878 in Saine-Etienne. He went to study in Lyon and it was there that he learned to paint flowers in an ethereal manner. After his studies at the Beaux Arts in Lyon, Chaleyé left for Paris where he met artists such as Derain, Mary Cassatt and Toulouse-Lautrec. Chaleyé left Paris to teach drawing and continue painting in Le Puy. The painting has been recently cleaned and varnished. Excellent condition.